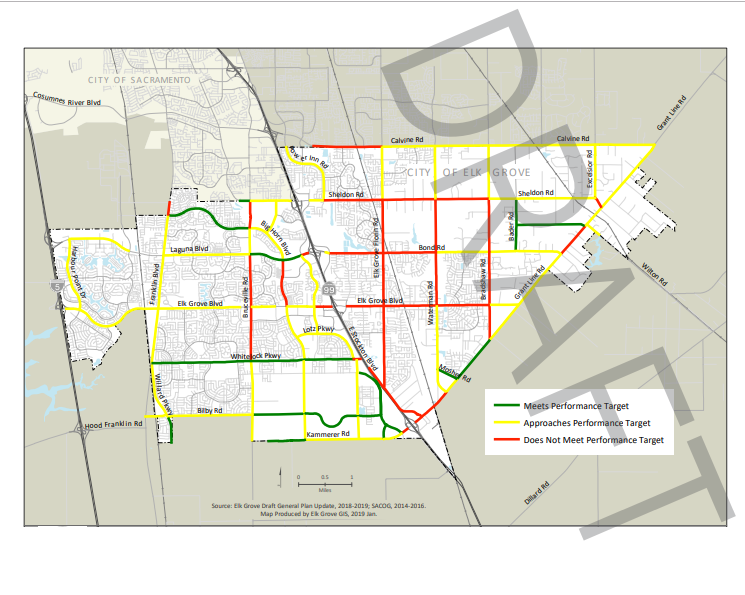 Although the city council chamber was mostly vacant during for the last agenda item during the Wednesday, April 10, Elk Grove City Council meeting, a report on the city's draft Traffic Congestion Management Plan provided one of the rare times when an unvarnished report was presented by city staff. The report, which was provided by Jeff Werner, the city's engineering services manager painted a realistic picture of the numerous challenges for traffic congestion. Werner's emphasized two main points during the presentation. The first point was that the city cannot build its way out of the jam. And secondly, things will continue to deteriorate (see the entire presentation and agenda item in the video posted below). "I would like to close by saying when we were putting this together, we thought it was really important to identify exactly this," Werner said referring to an image displayed in his presentation shown above. "The fact that is in the future our traffic congestion is going to get much worse." Before providing the assessment, Werner outlined many of the plans formulated by the city to address the problem widely identified by many residents as the biggest concerns for the city's future. Although Werner detailed the plans concocted, there is one significant hurdle - funding. "The problem is while this plan identifies what we think are the solutions, there is no funding for it at the moment," Werner noted. "We seek out grant opportunities, there are few and far between, a lot of our efforts road capacity increasing projects, and that's great, but we are not going to build our way out of this thing." During their opportunity to comment on the draft report, Council Member Darren Suen asked Werner if the study examined things like increase rideshare, bike share, and trail development. Werner acknowledged that alternate modes were included, but said they would have little effect on alleviating traffic congestion. "Unfortunately, those don't have the congestion relief that one may think," Werner said. " They help, but the totality of them I don't think is going to get us where we need to be as much as perhaps the technology piece." Speaking during public comment, Elk Grove resident Lynn Wheat complimented the report calling it an honest assessment. A longtime smart-planning advocate, Wheat questioned the value of video traffic systems mentioned in the report citing many failed systems in other cities and suggested that Elk Grove should collect impact fees, which have been significantly reduced in recent years, from developers for mitigation measures. Wheat also said the city council's willingness to look pass traffic concerns when approving projects based on overriding considerations are primarily responsible for the traffic congestion problem. "Since you have continued to set policies adopting overriding consideration for traffic impact, which is the primary cause of traffic congestion," Wheat said. "And it was determined that the economic development benefits justify the traffic." She added, "Isn't it true that the congestion management measures outlined in the plan are simply like rearranging the deck chairs on the Titanic."